Remember when I dubbed this the Summer of Ice Cream, way back on Monday? I have an addendum. Yes, friends, this is the summer when I make peace with deep frying and give state fairs everywhere a serious run for their money! I’ve always been a little fascinated-slash-horrified by the news stories I read every summer about the latest deep-fried foods coming out of amusement parks and fairs. Fried bubble gum! And Kool-Aid! And PB&J! America, what is going on? I’ve decided that carnies shouldn’t be hogging all the frying fun, so I’ll be tackling some fun and crazy frying projects over the next month or so. Every Friday (or Fry-day—see what I did there?) I’ll share a new fried dessert recipe with you. Forget the Ferris wheels and roller coasters—here at SugarHero, we make our own fun!Up first: Deep-Fried Chocolate Chip Cookie Dough! In the interest of scientific inquiry, I tried a number of variations for this dessert: I made cookie dough both with eggs and without eggs. I tried batters with eggs and without eggs. I fried the balls both when they were frozen, and when they were merely chilled. And of course, I tasted each batch. For science! 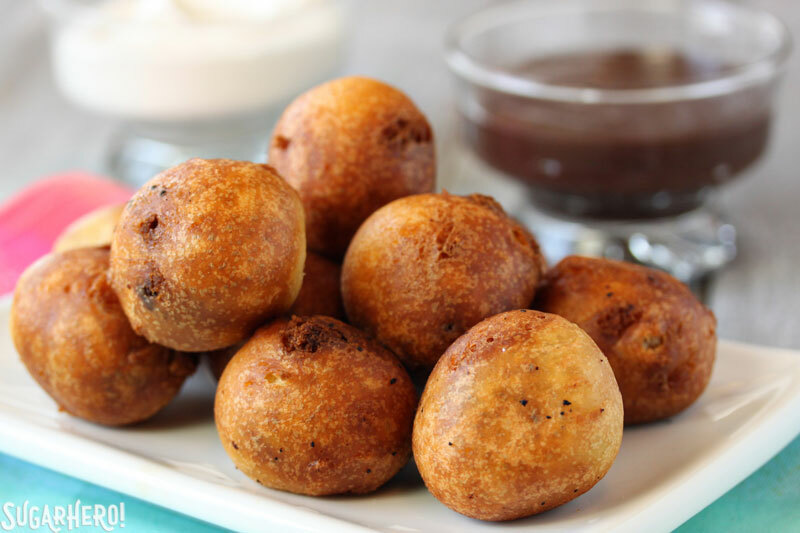 So when I say that these balls are really, really good, you know that I can be trusted, because I think I’ve eaten more deep fried cookie dough than anyone else, ever. That’s an achievement I’ll be bragging about at the next class reunion for sure. 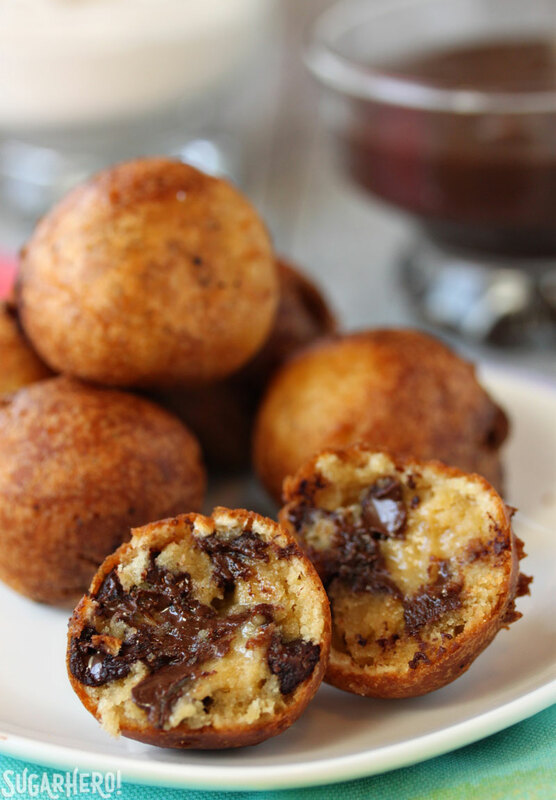 So let’s talk about what you’re actually getting when you deep fry cookie dough. After frying, the balls are beautifully smooth and round, with a crispy, slightly sweet coating that’s hard and crunchy on the outside, but nicely fluffy on the inside. The cookie dough becomes melted and warm and starts to cook around the edges, but definitely remains dough-like in the center. If you eat them when they’re fresh from the fryer the dough portion is gooey, like in the picture above, but if you let them cool to lukewarm, the dough will continue to cook and set, and will be a little more solid, like in the picture below. It is definitely still like eating cookie dough, rather than a fried cookie, so use that as your guide in determining whether you’d like this dessert. I think the chocolate chips are absolutely necessary to give them the best flavor and texture, so don’t get any cute ideas about trying this with plain sugar cookie dough or something. But as far as making other changes, go crazy! 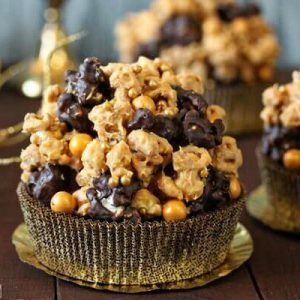 Try adding other flavors of baking chips, or even chopped candy bars, or experiment with the dough itself and do a chocolate variation instead. Of course fried foods will never be healthy, and are, as Cookie Monster might say, a “sometimes food.” But that’s true for almost any dessert, so as long as we’re not all eating fried cookie dough for dinner every night, it’s all good. Let’s do this thing. Go a little crazy in the kitchen, try something new, and show those carnies a thing or two! Now there's a new way to enjoy chocolate chip cookie dough! 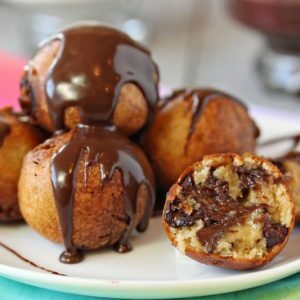 In this recipe for Deep Fried Chocolate Chip Cookie Dough, balls of cookie dough are dipped in batter and fried, producing a unique dessert that is warm and crispy on the outside, and gooey and melty on the inside. Top with a drizzle of chocolate for the ultimate indulgence. 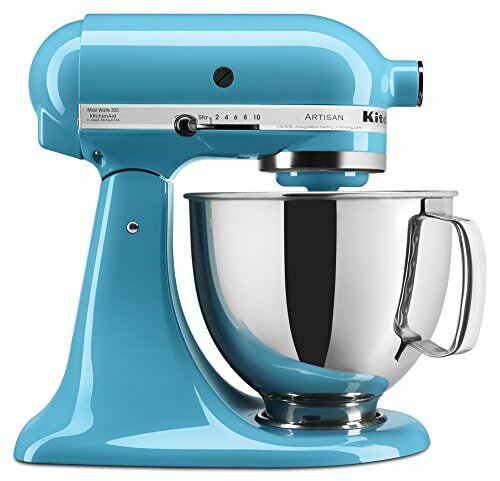 Combine the butter and both sugars in the bowl of a large stand mixer fitted with a paddle attachment. Beat them together for 2-3 minutes, until light and fluffy. Scrape down the sides of the bowl, then add the egg and vanilla extract and beat on low speed until combined. Stop the mixer, add the flour and salt, and mix again on low speed until most of the flour streaks are gone. Stop mixing, add the chocolate chips, and stir everything together with a spatula until it’s well-mixed. Use a 1-inch cookie scoop or a spoon to form the dough into 1-inch balls, and place them on a waxed paper-lined baking sheet. You should get about 20 cookies from this recipe. Chill the dough in the refrigerator until the balls are firm, at least 1 hour. Dough can be made several days in advance and kept, well-wrapped, in the refrigerator until ready to use. To make the batter, whisk together the flour, baking powder, salt, and sugar in a medium bowl. 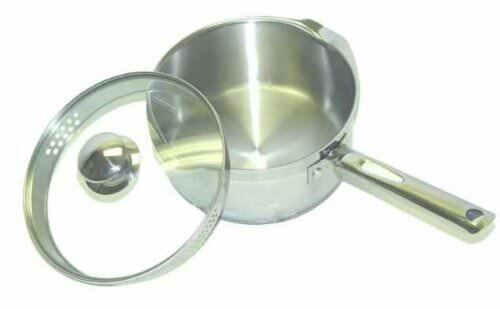 Add the milk and 2 tsp of vegetable oil, and whisk until the batter is smooth and free of lumps.Pour the frying oil into a medium saucepan so that it’s 2 inches deep. Insert a candy/deep fry thermometer and heat the oil over medium heat until it reaches 360 F (182 C). Once at 360 F, take a chilled ball of cookie dough and dip it in the batter, turning it over with your hands until it’s completely covered. Let excess batter drip back into the bowl, then gently drop it into the oil. Repeat with 2-3 more dough balls, so you’re frying 3-4 at a time. Fry the balls for about 2 minutes per side, flipping as necessary so that they cook evenly.Fry the cookie dough balls until they’re puffed and a dark golden brown on all sides. Remove them from the oil using a frying skimmer or slotted spoon and place them on a paper towel-lined baking sheet to drain. 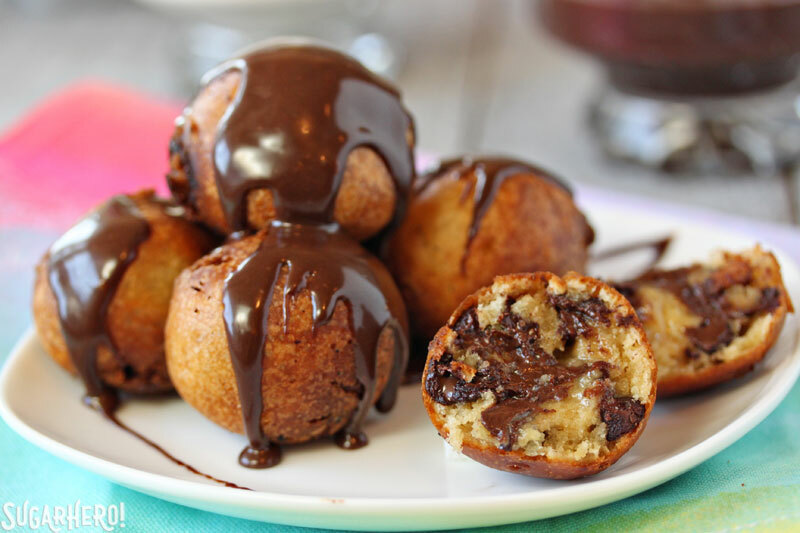 Repeat with the rest of the cookie dough balls and batter. 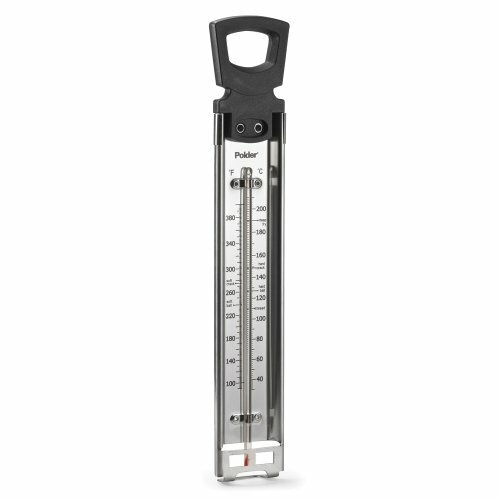 Watch the temperature of the oil and keep it between 360 F-370 F (182 – 188 C)—remove it from the heat if it gets too hot, or let it warm up in between batches if the temperature drops too much. These balls are best served warm, but not hot. Garnish them with a drizzle of chocolate sauce, a side of whipped cream, a sprinkling of powdered sugar, or nothing at all! I made these with two different batches of dough: one with eggs, and one without. The outcome was similar, but I found that I preferred the texture of the dough with eggs: it stayed softer and melted a bit more during the cooking process. If eating raw eggs are a concern for you (since the dough does not fully cook during the frying process), I suggest using a pasteurized egg in this recipe. If you want to try it egg-free, substitute 3 tablespoons of milk for the egg in the recipe. Additionally, readers have mentioned that they have tried this recipe with store-bought dough, and they report that it works well! Oh man – I need this! Ryan Seacrest was just talking about this on the morning too so I’ve been craving this like crazy! I mean…. I really want to say all kinds of things about this but I’m completely speechless. How about I’ll just take a couple batches!! Just found your blog. I will indeed be sharing it with my friends and family. Love the recipes and how well it is put together! I didn’t think chocochippers could get any better. You somehow managed to make Friday (fry-day) even more amazing! Gotta try this! Yes, I too am horrified of all of the deep fried goodness (if you can even call it that) that I hear about. 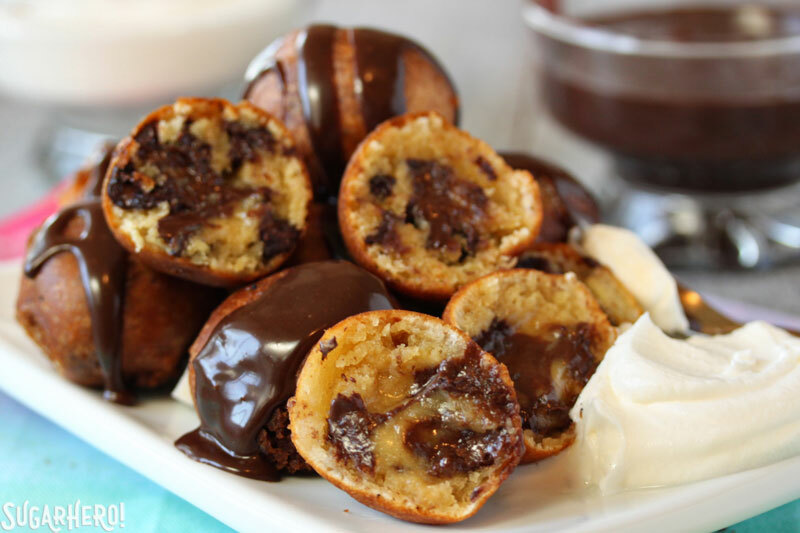 However, if I saw these deep fried chocolate cookie dough treats, I’d definitely try them! Pinned! Seriously this looks too good to be allowed! Must try this! Must try this! You must, you must! Thanks Jo. Let me know how it goes if you give it a try! There is NO SUCH THING as too far! This looks easy enough that I think I will try it. Thanks Dave! Seeing your name gave me a great idea: deep fried fudge?! Wow. I kinda can’t believe this! My kids would LOVE these. Totally sounds like an outdoor deep-fry family bonding session just waiting to happen!! Good stuff…. Elizabeth Q. Sugarhero (I’m sure that’s your name) you have officially raised the stakes! These look like something the devil himself would concoct to lure people to the dark side. Or Darth Vader, because the dark side was a Star Wars thing, I think. 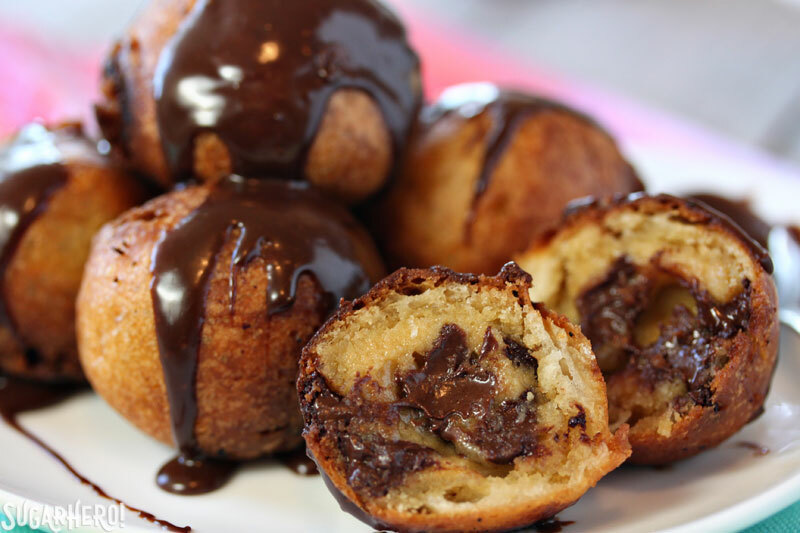 Either way, I slow clap at these fried cookie dough balls. SLOW. CLAP. Sarah you crack me up on a daily basis. I am now changing my legal name to Elizabeth Q. Sugarhero, and I told Jason I’m expecting a slow clap every time I walk into a room from now on. OH my word. I made this a couple weeks ago and it was AMAZING! Like life changing amazing! I love that you made the fry batter. Awesome to hear we’re on the same wavelength! And apparently Ryan Seacrest is on our wavelength too, since he was talking about this earlier in the week…? Great minds obviously think alike. Soy loco por lo cookie dough frito! Love this, obviously. And I really appreciate that you tested this a bajillion different ways–science is alive and well at Sugar Hero! Fortunately cookie dough frito is legal in both Mexico AND the US. Now to get Richard Simmons to endorse them! Did you use mini or regular size chocolate chips in this recipe. Also, what type of chocolate chips did you use milk, semi, bittersweet etc. Hi Jackie! I used regular semi-sweet chocolate chips, which I liked because there were big pockets of melted chocolate–but I’m sure mini chips would also work. I’d say either semi-sweet or bittersweet chocolate is best, milk might be a bit too sweet (but then again, I’m a dark chocolate lover, so take that into account). There are no eggs listed in the ingredients but mentioned in the instructions. How many eggs? I would love to try this seeing that chocolate chip cookies are my favorite! Never mind. I see it now. Lol. omg.. these look ridiculously amazing! I haven’t played with frying much. What is the best type of oil to use? Thanks Alyson! I think the conventional frying wisdom is that peanut oil is one of the best to use, because it has a high smoke point. I didn’t have any in the house and used vegetable oil, and it worked out perfectly. These look so good! A definite must try. FYI for those wary of raw dough, it’s the flour you’re more likely to get salmonella from than the eggs. I myself am not too concerned about it, but it’s good to know for those who might be worried. In case you were wondering… you don’t want to be lazy and skip the batter. Doesn’t turn out so well LOL! On the plus side my deep fyer smells like cookies temporarily until I replace the oil. Haha! Good to know! Sorry they didn’t work out, but we can say you did it for science, right? And at least you have a nice cookie smell to comfort you. Please let me know what you think if you try it again! Hi Kari, I’m so sorry to hear that the recipe didn’t work for you! I hate to hear that. If you ever want some help troubleshooting, please don’t hesitate to email me at elizabeth (at) sugarhero.com. I saw these on facebook and made them the next day. They were a lot of work, but so good! I don’t usually fry things so I burned a few in the beginning but most of them turned out. My family loved them, thank you! Do you think they would work with other kinds of cookie dough? Thanks, Joyce! I appreciate the feedback and am glad your family liked them! I would say that they would work with other firm-textured cookie doughs (nothing too soft that would spread during frying), and I also think that the chocolate chips in the dough really improved them, so maybe consider adding chocolate to whatever dough you want to do. But yes, experiment, and please let me know how your other doughs turn out! Can’t wait to try this recipe. Thanks for the research. Your recipe calls for vegetable oil. Most vegetable oil in the US is really soy oil — which I’m allergic too. What about using peanut oil or coconut oil? sounds like it would taste better to me! 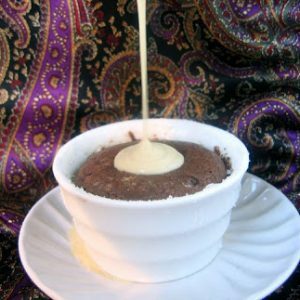 I tried this recipie using store bought pillsbury cookie dough and it worked great! Delicious! Hi Elisabeth! I’d love doing this cookies! But there’s a thing that I haven’t understood well… What have I to do after preparing the dough and putting it in the fridge but before frying the balls? Hi Martina, Once the balls are formed, all you have to do is make the batter, dip them in the batter, and fry them! That’s it. 🙂 Does that make sense? Stop it! These are ahhmazing! A must make for sure! Thanks! Can’t stop, won’t stop! Thanks! I made these tonight substituting the sugar and brown sugar with Splenda brown sugar mix. Also used sugar free chocolate chips and skipped the powdered sugar. Amazing! What happened when you cooked from frozen? I have some peanut butter chocolate chip dough begging to be fried, but it’s in my deep freeze. Hmm, my guess is that it would just be more raw in the middle because it wouldn’t be able to cook as quickly as the outside. But if that sounds good to you, that wouldn’t be a problem at all! Raw cookie dough is yummy too! I recently came across your site. I’m in love. 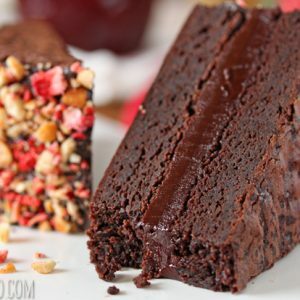 There are so many wonderful recipes on here that I will be able to WOW with thru the holidays. Thank you, I’m your newest fan. So glad to hear it! Happy cooking and happy holidays! Sounds like a fun night! Thank you so much!